Roy De Forest, Country Dog Gentlemen (detail), 1972; polymer on canvas; 66 3/4 x 97 in. Courtesy San Francisco Museum of Modern Art. Though it spans eighty-five years and includes some of art history’s biggest names, Fertile Ground: Art and Community in California, at the Oakland Museum of California (OMCA), is far from a survey exhibition. Curators from OMCA and the San Francisco Museum of Modern Art (SFMOMA) honed in on four very specific times and places, making no attempt to tell every possible story. And yet, there are many historical lessons to be learned and one may even walk away with a bigger picture. Fertile Ground is divided into four sections covering four different communities of artists: Frida Kahlo and Diego Rivera, and the artists associated with them during the time they lived in San Francisco; the post-war faculty and students at the California School of Fine Arts (now the San Francisco Art Institute); the art department at UC Davis in the 1960s and ’70s; and the “Mission School” starting in the ’90s and continuing until today. One exciting work to see in the first section is Kahlo’s Portrait of Dr. Leo Eloesser (1931), featuring her San Francisco doctor. The oil painting, a gift from Kahlo, depicts Dr. Eloesser, a San Francisco native, standing next to a model sailboat. Many Kahlo fans may not recognize this work because, after it fell into possession of one of Eloesser’s friends, it was donated to UC San Francisco with the requirement that it be displayed at San Francisco General Hospital, where the doctor worked for thirty-six years. Another piece viewers may not be familiar with is Rivera’s Allegory of California (1931). The fresco is housed in the City Club of San Francisco, a private social club, which is not a far cry from the Pacific Stock Exchange Luncheon Club that occupied the Financial District building when Rivera painted the mural. In addition to a reproduction at OMCA, several studies from Rivera’s plans are on display, including drawings of gold miners, famed botanist Luther Burbank, and a boy with a model airplane. In the final piece, these figures are accompanied by an army of oil derricks, two disembodied hands overflowing with fresh fruit, and the stump of a giant tree — a suitable allegory indeed. The exhibition also includes works from major photographers who were revolutionizing the incipient art form while Kahlo and Rivera were in San Francisco. Many works from Group f/64, several photographers organized in the Bay Area in the ’30s, are on display. Imogen Cunningham, a Portland-native who moved to San Francisco in 1920, is represented by a classic example of her botanical photography. Sonya Noskowiak’s photograph of a lonely and weathered fence on Stinson Beach seems to collapse the eighty years since its creation, offering an image of something a daytripper might find if she ventures just a little off Highway 1. The pivotal connection between these artists — as well as Ansel Adams, Dorothea Lange, Willard Van Dyke, and Edward Weston — and Kahlo and Rivera isn’t entirely clear. They all lived and worked in the region at the same time and many benefited from the patronage of Albert M. Bender, a wealthy insurance broker, but the reason for centering all the artists around Kahlo and Rivera never fully reveals itself. The gallery dedicated to the California School of Fine Arts (CSFA) is, along with the UC Davis gallery, an anchor for the curatorial and historical concept of Fertile Ground. The transition between the Kahlo and Rivera gallery and the CSFA gallery contains works from Group f/64 members, including Adams, who urged the school to create a photography department in 1946. Cunningham was an early faculty member with Lange, Weston, and Minor White. Cunningham’s Edward Weston and His Cats (1945) is an amusing look at one future colleague by another, picturing Weston leaning against a table in his backyard besieged by tabbies and short hairs. At the same time photography was being institutionalized, the end of World War II and the creation of the G.I. Bill brought a surge of new students and faculty to CSFA. Among these were Abstract Expressionists and a new generation of painters that would inaugurate the Bay Area Figurative movement. Richard Diebenkorn, who had an intimate relationship with the Bay Area, is well represented in Fertile Ground with works from multiple stages in his career. Between 1946 and 1949, Diebenkorn studied and taught at CSFA; he returned in 1959 and taught through 1966, before moving to Southern California. A large untitled painting from 1949 represents an early period in the artist’s work in which he was still heavily influenced by Abstract Expressionism. No discernible objects emerge from the panoply of lines, splotches, and brushstrokes. By the time Diebenkorn completed graduate studies at the University of New Mexico and returned to the Bay Area, his work had become more figurative, as seen in Figure on Porch (1959), which features an abstracted figure, fields of color, and rough coloration. The UC Davis gallery includes works by William T. Wiley and Roy De Forest, who both studied at CSFA in the ’50s and early ’60s. 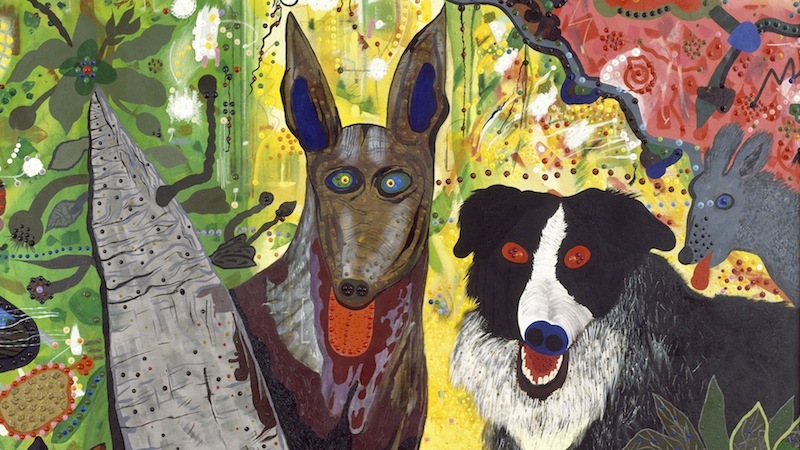 De Forest dominates the gallery with Country Dog Gentlemen (1972), an eight-foot long painting of whimsical yet possessed-looking dogs against a kaleidoscopic background of greens, yellows, and reds. Country Dog Gentlemen, like much of the work in the UC Davis section, marks a shift to a more playful, if not also mischievous, style, as compared to the blunt weightiness of Social Realism, Group f/64, and Abstract Expressionism. This portion of the exhibition also includes considerable sculptural works, such as Robert Arneson’s iconic semi-self portrait, California Artist (1982), in which he poses as a smug, aging hippie on a pedestal emblazoned with marijuana leaves. Bruce Nauman, who is likely Arneson and Wiley’s most well-known student, created his sculpture Wax Impressions of the Knees of Five Famous Artists (1966) in the same year he earned his MFA from UC Davis. At first glance, it appears to lack the lightheartedness of his mentors’ works — it is uninviting and has the color of an aged and used eraser. But even if you didn’t know that the impressions were only Nauman’s own, the work’s label betrays its impishness by disclosing the material as fiberglass and polyester resin, not wax. While some Bay Area Figurative artists are still living, and many of the UC Davis figures are still practicing, with artists still in their 40s — including Chris Johanson, Alicia McCarthy, Barry McGee, and others — the “Mission School” gallery feels a bit out of place among the historicized offerings in the other galleries. The inclusion of works from 2014 suggests that this story is far from over and maybe shouldn’t be encapsulated in the same way as Group f/64 or Kahlo. This section, nonetheless, includes fantastic pieces by important artists and is certainly a treat for anyone interested in the “Mission School.” Viewers may recognize Barry McGee’s untitled mixed media installation of a bulging mass of framed drawings and photographs. The imposing piece was previously shown in SFMOMA’s 75th-anniversary exhibition (2009–11), and a related work was in McGee’s 1996 SECA Art Award exhibition. An untitled twenty-six foot painting from the late Margaret Kilgallen adds greatly to the “Mission School” section. The painting resembles a mural as much as a canvas painting, referencing the artist’s interest in street art, as well as the tradition of muralism in San Francisco’s Mission District. The piece features a couple, one facing the viewer and the other looking away. The couple doesn’t appear annoyed, but they don’t seem to particularly care for the gaze directed their way. The painting benefits from Kilgallen’s trademark flatness, which recalls graphic design, cartooning, and printmaking; its simplicity manages to tell a story about this couple. From Kahlo to Kilgallen, the works in Fertile Ground tell many other stories, not just about their subjects, but about the artistic spirit of the Bay Area. Visitors will not learn about all of the twentieth-century art movements with grounding in the Bay Area. But they will see a collection of artists that represent much of the Bay Area. If approached as a survey, some viewers might be disappointed, but if considered as an allegory, like Rivera’s fresco, Fertile Ground is quite successful.